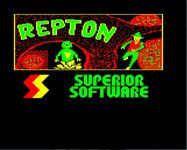 Repton is a British computer game originally developed by a then 15-year-old Tim Tyler for the BBC Micro and Acorn Electron and released by Superior Software in 1985. The eponymous protagonist, Repton, is a lizard who crawls around an underground maze in a quest to find all the diamonds (some being held in safes, their release being triggered by finding and collecting a key) within a time limit in each of several levels, while avoiding being trapped or killed by falling rocks and monsters hatched from eggs. Source: Wikipedia, "Repton_(video_game)," available under the CC-BY-SA License.